Wednesday 5th April was a special and important day at the High Pasture Cave excavations. 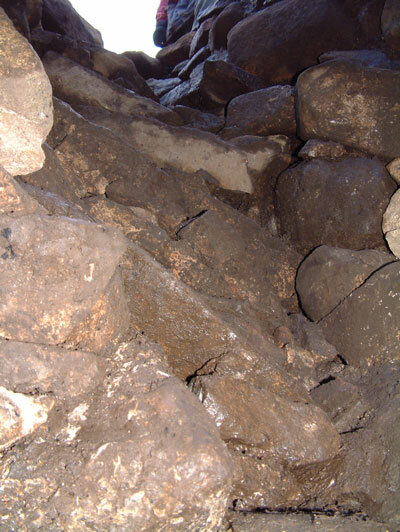 After 3 weeks of excavation in the stairwell, including the excavation of the burials in this structure in 2005, we removed the remaining pockets of stone and sediment fill to reveal the natural limestone entrance of the cave. We are fortunate in that the stone-built stairwell has survived remarkably well over the past 2000 years, despite evidence of collapse in antiquity that had been repaired to retain access into the cave beyond. 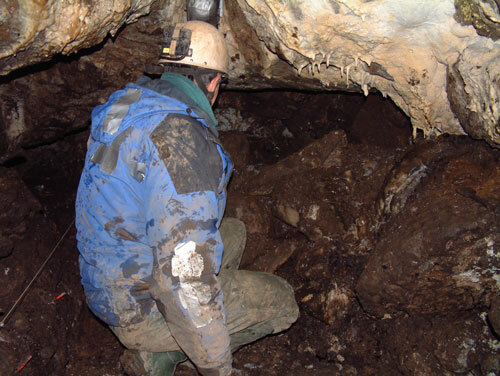 Excavations in Bone Passage in 2004 and 2005, combined with geophysical survey at the site in December 2004, had revealed the location of the blocked entrance into the cave. Archaeological deposits and artefacts recovered from Bone Passage suggest the use of the site for around 1000 years, before it was sealed to the outside world around 2000 years ago. The final act in the blocking of the former entrance included the burial of a woman, a young infant and a foetus around 4-6 months of age (see report on the Human Remains in ‘The Work’ section). The bones of a foetal pig had also been mixed in with the remains of the infant and foetus, possibly indicating that some emphasis was placed on the pig in life and death. The deposits removed from the stairwell comprised small to large stone and sediments containing archaeological material including charcoal, burnt cereal grains, pockets of ash and burnt bone, and isolated fragments of unburnt animal bone. 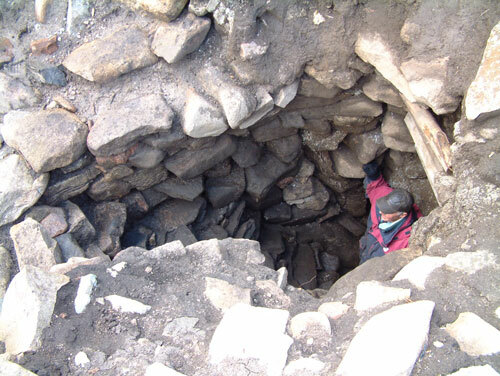 However, as we cleaned down onto the steps forming the base of the stairwell the archaeological deposits increased in quantity and it was here that we recovered most of the sherds of pottery and larger pieces of animal bone - possibly deposited when material was being transported into the cave below. The highest concentrations of small finds and ecofacts were recovered from the base of the stairwell, where a vertical drop of around 0.7 metres ends on a relatively flat area before dipping under the arched roof of the cave. Here, we found significant quantities of animal bone including pig, cattle and red deer, worked red deer antler, antler and bone tools, stone tools, a fragment of a vitrified stone crucible with adhering copper/bronze deposits, a decorated stone palette and a significant quantity of pot fragments. Some of the pottery is decorated with chevron patterns below the rim, otherwise the majority appear to be plain vessels. The integrity of the stairwell was mentioned earlier, although evidence of collapse was also clear to see as we excavated the structure. In particular, we had noticed that the steps in the stairwell tilted downwards to the west, the angle increasing with depth. It appears that some form of structural failure had occurred on this side of the structure in antiquity, although repairs had been carried out to retain the access into the cave below. 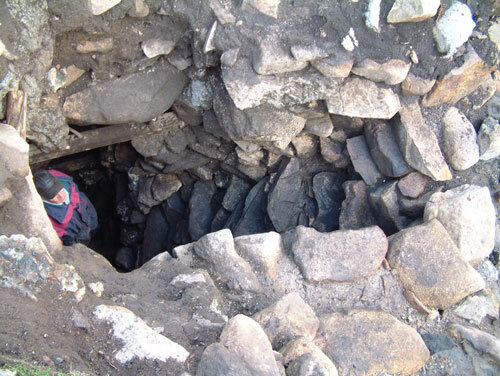 However, a more major collapse has occurred on the east side of the stairwell, which may have resulted in the back-filling and abandonment of the structure in the Iron Age. On this side of the passage, drystone walling has been bridged off the underlying natural limestone. This was generally carried out by using lintel stones such as the one visible in the image above. The stone, which originally supported courses of drystone walling, has rotated forward on its seatings causing the walling to collapse. This failure in the structure also caused the large lintel stones that once formed a roof over the entrance to slump into the stairwell. We encountered at least three of these large lintel stones in the lower fill of the stairwell, granite slabs that measured over one metres in length that would have rested on the corbelled side walls of the structure. However, the remaining stonework in the structure is well-built and has survived remarkably well. In particular, the granite boulders forming the west wall of the stairwell are very large and extend back into the surrounding midden deposits on this side. Now we have exposed the structure, it is also apparent that there is several phases of construction of the entrance. Differences in the quality of the stonework and changes in the overall build are visible, possibly indicating that the structure was modified and elevated as the midden deposits filling the natural depression, immediately in front of the natural cave entrance, were deposited. The access to Bone Passage from the base of the stairwell is quite constricted, with a height of around 0.7 metres between the bottom step and the natural limestone roof. Further cleaning and recording work is now necessary in the stairwell, before any stabilisation work is undertaken. 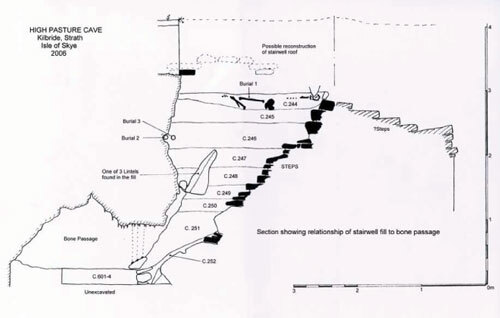 The investigation of the interface between the remaining deposits in the base of the stairwell and the deposits in Bone Passage will also be carried out, to investigate modes of deposition and the back-filling of these features. My husband and I visited the site last week and were made very welcome. The archaeologist spent some time just explaining what was happening - an amazing experience, still can’t quite believe how fortunate we were and hope to return next month to assist and to learn more. Many, many thanks. Many thanks to you all for the visit today - couldn’t have been better. The jelly babies were an added bonus. I am still following your progress on the cave. More recently the weather has not been kind to you and the team. However now that ‘summer’ might be here soon I hope to drop in and learn something by hands on. When is your next Open Day - fortnight? Congratulations on all the hard work. It all looks so exciting. Will you be having another open day or two in the summer?